Winter, spring, summer, or fall -- no matter the season, it’s always time for our favorite heady, bready, boozy brew. Austin’s beer scene keeps on growing, and even those restaurants and bars who previously leaned on the big brands are slipping a microbrew (or five) into their taps. 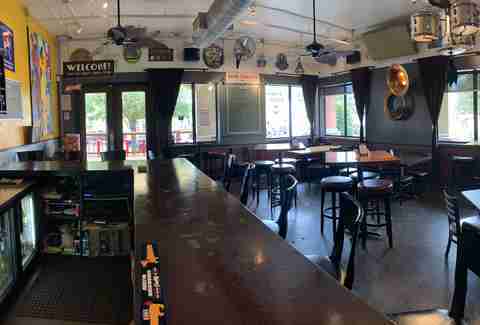 Then, of course, you've got the bars that specialize in offering truly kaleidoscopic beer selections, rotating their drafts regularly and helpfully explaining their taplists to anyone who needs it; those are the bars we're concerned with. 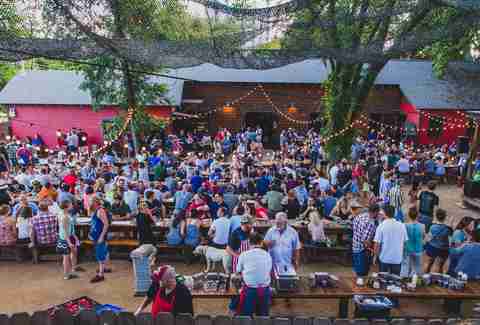 Whether you’re into a saison or a sour, a hop-heavy or a hefeweizen, Austin’s bevy of beer bars have got your back -- and when you're ready to trace those local beers to their source, check out the best breweries in (and around) Austin. Draught Haus was doing craft beer when it was still weird and quirky and deeply nerdy; you could sit in their parking lot and drink beer and espouse your love for whatever non-domestic you were downing. Now that liking craft beer is it’s trendy to like craft beer, they’re still on top of their game, brewing their own and repping some of the most delightful taps in town. They’ve also built out a Biergarten and host food trucks, and there are drink specials almost every night. With over 50 Texas taps, Craft Pride takes... well, pride in its crafts and in our state. Committed to supporting local business, a large percentage of the taps are reppin’ Austin breweries. They rotate seasonally and host limited edition release parties, meet the brewer events and tap takeovers. In addition to one-off special events, stop in for trivia on Tuesdays, movies on Wednesdays, and music most nights of the week. 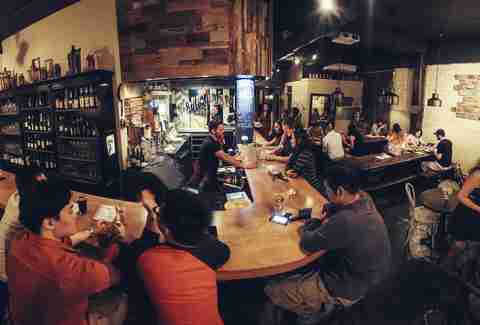 The dual nature of the Brew and Brew adds to its allure; a crowded coffee shop by day, Wright Bros' patrons begin to shift to the beer-loving set around 3pm. Their 39 taps are represented on the menu by flavor (hoppy, dark, light, funky, and sour) and share space with wine, mead, and cider. The taps change often, so you’ll want to keep an eye on the list to make sure they’ve got what you want or just trust your local beerista to steer you in the right direction. With a beer footprint that belies its actual square footage, Hopfields somehow blends the classy with the casual, the traditionally French with the French fry. They have 44 rotating taps that represent a local and national cross section of beers like the Saison Rose from Cooperstown, NY, the Curmudgeon Old Ale from Grand Rapids, MI, the Coffee Porter from Austin's own Celis Brewery, and the Milk Stout Nitro from Longmont, CO. Their menu is French-inspired and includes a delightful brunch that ventures out with a Duck Reuben and Shakshuka. Whip In’s been making the craft beer/Indian fusion combo happen since 1986, and they’re just getting better with age. What started as a convenience store evolved into a gastropub with 70 (!!) beers on tap, a full wine list, and a from-scratch kitchen that boasts things like Mumbai Migas and a “Chicken Lollipop.” The beer menu reads like War and Peace, with wheats, wits, ciders, sours, Belgians, ambers, IPAs, lagers, ales, and blondes, plus everything in between. Grab a draft, enjoy the sun, and get into some samosas while you're at it. With a combination of cheese, beer, and baked goods, Easy Tiger is like a food-based adult Disneyland. They’re doing so well, in fact, that they’ve just debuted a new location, meaning you can find them in Whole Foods 365, Fareground and now, The Linc. Stop in for a pretzel and a cold beer from one of their 30 taps, or opt for heavier fare like housemade meats and sandwiches. 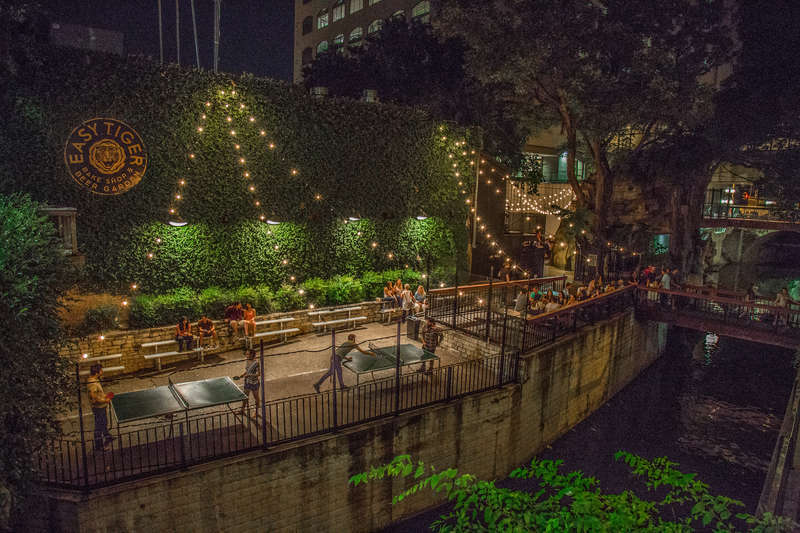 Both standalone locations boast a beautiful bar, an outdoor beer garden, and ping pong, naturally. You wouldn’t think of this spot as a beer bar... but you’d be wrong. 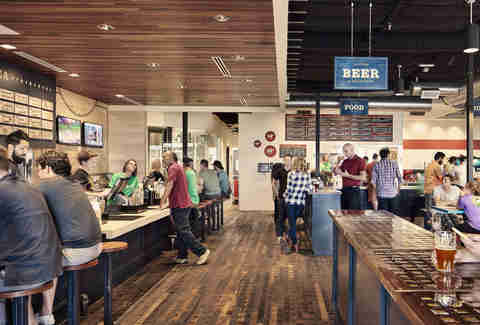 It’s kind of weirdly the ultimate beer bar -- a beer bar where you can drink in-store and also leave with a giant growler of your favorite brew. They craft personalized growlers, glassware, and steins, and with 30 taps flowing freely, you can sip, sample, get a flight, or pull a pint. Once you’ve figured out your favorite flavor, grab a growler, fill ‘er up, and take it home to enjoy for the rest of the night (or maybe even the following morning). They also offer cider, mead, cold brew coffee, and ginger beer. Nothing goes together like pizza and beer -- except maybe a handmade pizza and a crafty beer. Pinthouse likes to level things up and they do so with aplomb at both of their locations; in addition to their own award-winning beers, they have a rotating tap list that's in such high demand they actually have a live tap feed and a tap schedule that includes releases and events. Stick your toe in the proverbial Pinthouse pool with one of their spectacular under $11 lunch specials, and then stay awhile. Workhorse is the kind of place where you just belly up and order a beer. Squeezed into a funny little spot on North Loop, it feels like a beer bar should feel with its heavy wooden furniture, excellent grass-fed burgers, and those seasoned pretzels. Over 30 of its 50 taps are local drafts, and for your buds looking for something a bit stronger, their margarita is like a delicious kick in the teeth. The outdoor patio area is always buzzing, and you will be too after a couple Hop Delusion Double IPAs. 207 -- that’s the number of craft taps Banger’s is boasting. 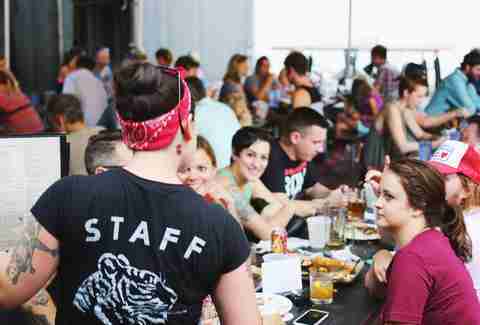 It’s has been an immensely popular destination for beer and brunch aficionados alike for years, and now, with its massive and much-lauded expansion, it can accommodate the incredible number of people clamoring for their new beer list and whole hog barbecue program. They also added a fermentation room, a new smokehouse, and a number of outdoor drinking areas. You’ll want to set aside an entire day to enjoy this spot. The first all-Belgian beer bar in the US, Mort Subite exudes European Charm. They’re not just a bar that serves Belgian beer, they have re-created the Belgian beer pub. They offer over 20 taps and 40 bottles, and glassware is king: every beer is served in its appropriate vessel, and they’re a delight to behold… tall flagons, round fat bulbs, and some with their very own support contraption. Plus, they’ve recently begun serving crepes, which we all know are the perfect accompaniment to a yeasty beer. 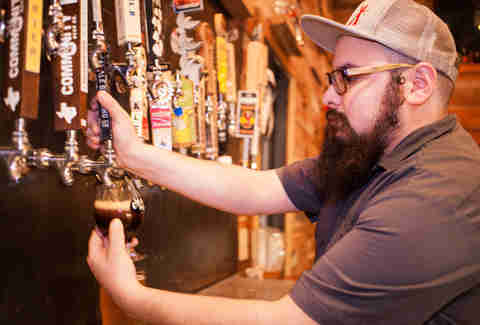 This intimate East Austin pub pulls no punches when it comes to having the best beer on tap. Hi Hat tends to attract neighbors and service industry folks who stop in for lunch and a pint, or for some live tunes on a weeknight. They rotate taps frequently (as any self-respecting beer bar should), and have some heavy hitters like North Coast Old Rasputin on Nitro, and the elusive (512) Barrel Aged Pecan Porter. The menu is American with a gastropub feel, offering items like Windy Hill goat nachos and an Akaushi beef burger, and winelovers can also find a home here on their Wednesday half off bottles night. It feels strange to include a grocery store here, but Whole Foods is always breaking the mold. Grocery shopping is a lot more fun when there’s a full-fledged beer bar in the middle of the store, and with nearly 50 on-tap options and a menu from Garbo’s Fresh Maine Lobster, this unexpected gem is a great break from trolling the aisles (or from your workday). Make sure you check the daily specials, and grab a growler to go.